Every single one of us can identify with Johnny Gaudreau. We know our own skills and abilities, what we've done in the past and what we're capable of doing in the future. When we're seeking a job, we all want to work for a company that will pay us a salary that reflects that. We want an employer that will pay us what we're worth, damn it. The million dollar question, or more so the thousand dollar question for you and I, is what are our skills worth within the context of our chosen industry? That's where the employer comes in. Whether your company is publicly traded or privately owned, there is only so much money allocated for payroll as there are other operating expenses to look after. As the employer, when determining the salary for someone you're hiring for a particular role, your first step is to understand the competitive landscape and narrow down how much those services will approximately cost. Same thing applies if you're the GM of an NHL team. Acting on behalf of the owner and constrained by the non-negotiable upper limit of the salary cap, you must figure out how much you can fairly pay a particular player but within the constraints of your allotted budget. Part two, as noted, is after acknowledging the skills of the worker you're hiring and what's on their resume so far, a challenge with pro sports is you must also forward-plan. In determining the salary a player will make for the next several years -- a scenario unlike almost all other professions that are pay-as-you-go -- you need to decide right now how that person's role will evolve, what additional responsibilities might be taken on in the future, then figure out what that will be worth six, seven, or eight years down the road. In attempting to establish a marketplace for Gaudreau, a far more difficult endeavor than it was for Monahan, I've identified 10 contracts that are relevant. Those are listed below along with other pertinent details as well as some commentary. In using these 10 contracts as a point of comparison, note that this does not mean they are examples of what Gaudreau should also get for money and term. This is not an apples-for-apples thing, These are contracts that have relevance (which I explain) that you can use to measure his situation against to help determine whether the 23-year-old left-winger should make more, less or about the same. Why it's Relevant - Ekblad was the No. 1 pick in 2014. If the 2011 draft was re-done, a case could be made (and was made by NHL.com in June) that Gaudreau should have gone No. 1. With one year to go on his entry-level contract, Ekblad signed the extension after two seasons, which mirrors Gaudreau's situation in terms of service time. While Ekblad plays defence, the commonality is these are two first overall-calibre players, who both project to be future stars of their team. While scoring numbers will obviously not compare, the value of a young, two-way star defenceman that can play 25 minutes a night and be the backbone of the team for the next decade cannot be underestimated. There's a reason the adage is 'defence wins championships'. These coveted franchise-altering players are awfully hard to find but the Panthers have one. So in terms of being unique, Ekblad is right there in the same type of rarified air that Gaudreau finds himself in with his sublime offensive skills. 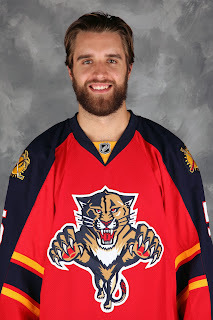 Worth noting for Ekblad is he's a former captain in major junior with Barrie, who inevitably will wear that same letter for Florida and sooner than later. Why it's Relevant - Tarasenko is a real force on the Blues and like Gaudreau will be the straw that stirs the drink for that St. Louis forward group for many years. He projects to be the future star of that team, putting him on equal footing with Gaudreau. These are two very different types of players but both are hugely important. While Gaudreau will dipsy-doodle around you, Tarasenko is more of a tank and with a rocket of a shot. 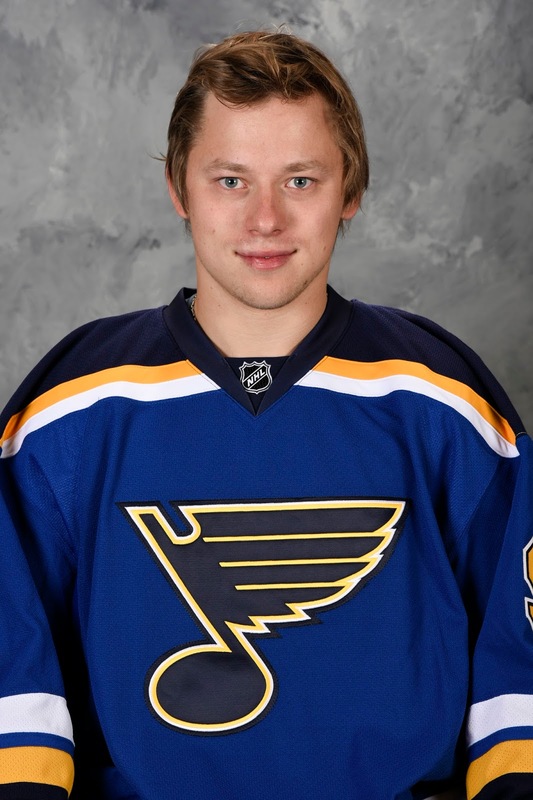 Tarasenko's production may not end up at the same level but he'll score a lot of goals. Plus, so far he has been more well-rounded in terms of his ability to produce on the road so far. Three seasons for Tarasenko also leaves St. Louis with a bit more assurance of what they have compared to Gaudreau with only two years. That said, I see them as pretty similar in terms of value to the team. Why it's Relevant - Despite being five years apart in age, Kane is the guy frequently brought up when you talk about a skill set comparison for Gaudreau. 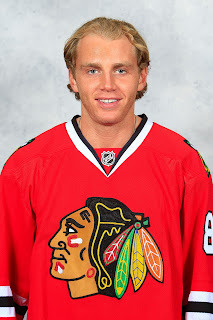 Also an American, Kane was first overall pick in 2007. The point total Kane racked up during his first two NHL seasons is eerily similar to Gaudreau -- 142 points in 162 games for Kane compared to 143 points in 160 games for Gaudreau. Kane did score nine fewer goals but did not have the benefit of 3-on-3 overtime. Plus, Kane broke in at age 19 while Gaudreau was 21. Kane also made a stirring playoff debut in his sophomore with nine goals in 16 games. Kane signed his extension two months into year three, a season in which he piled up 88 points -- a total not surpassed until last season -- and then racked up 10 goals and 28 points in 22 playoff games including scoring the Cup-winning goal in OT against the Flyers in game 6. Without the benefit of hindsight and knowing how spectacularly that final year of his ELC turned out, and just looking at his body of work at the time of signing in December, Kane was near where Gaudreau is right now -- although I'd suggest Kane was a little above given his playoff impact and how his third season had begun. Interestingly, it was in Kane's rookie season that his home points (51) dwarfed his road points (21), a trend that reversed the following season when Kane put up more points on the road (36) than at home (34). Of course, it's Gaudreau's home-road splits last year that might be viewed by the team as a red flag. While inflation aside, I'd put Kane slightly ahead of Gaudreau in terms of what they had achieved, the AAV number will be higher for Gaudreau due strictly to inflation. If you factor in that the salary cap has grown 23 percent since 2010-11, Kane's AAV of $6.3M converts to $7.75M in 2016-17 dollars. For me, that puts Gaudreau's AAV at between $6.75M and $7M for the same five-year term. That said, that length of contract due to the implications on his free agent status (discussed below in the summary) is highly unlikely. Why it's Relevant - Monahan and Gaudreau entered the summer in similar situations, both young stars that were RFAs. They have also been linemates throughout much of the last two seasons and each has contributed to the other's success. With his three seasons compared to Gaudreau's two, and playing the more high-profile position of centre, you could argue that Monahan has the better resume so far. But it's going forward where their career trajectories may vary. 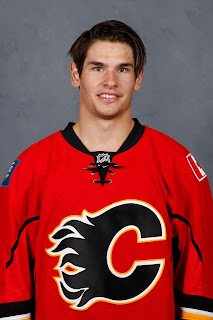 Monahan will remain an important piece for Calgary, but four or five years down the road he might surrender top centre billing to Sam Bennett. Meanwhile, Gaudreau will still be the guy that sells tickets, sells jerseys and is the catalyst of the offence. 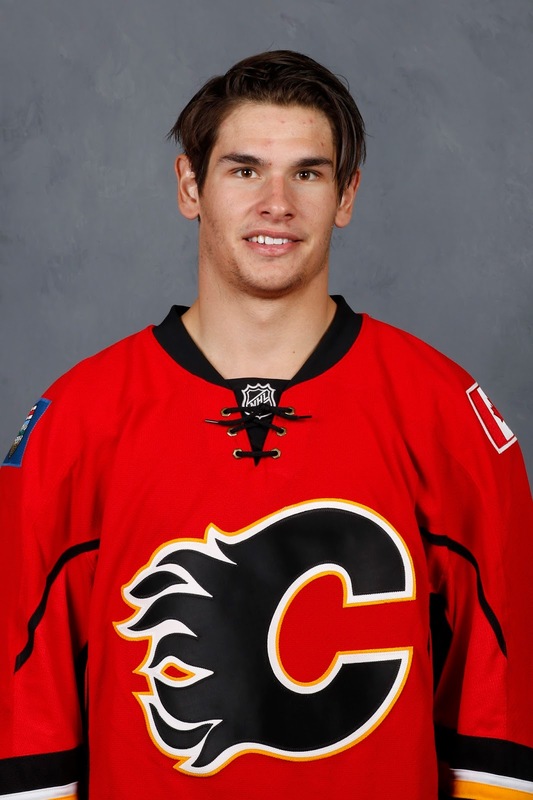 Monahan has been the best of his 2013 draft class so far but it's doubtful he holds onto that billing. Meanwhile, Gaudreau just might in respect to his 2011 classmates. That plus his ability to dominate singlehandedly will earn Gaudreau a bit more than Monahan's AAV. Why it's Relevant - Starting a career with a 20-plus goal season than a 30-plus goal season is rare. It's only happened 12 times in the past 12 years. Gaudreau is one of them and Hall would have done it too if not for getting hurt in his sophomore season and missing 21 games, which left him three goals shy of 30. Another first overall pick, Hall is a comparable talent, especially at that point in his career if you were to wind back the clock. Again, we're talking about a player built differently than Gaudreau, who has elements in his game that Gaudreau does not. That said, Gaudreau's raw skills are superior. The two players are in comparable situations in terms of experience given Hall also signed an extension after two seasons. Hall's projected impact at the time he signed his extension is probably similar to the forecast for Gaudreau moving forward. For all those similarities, the biggest difference once again is inflation. The salary cap was $64.3 million the year Hall's second contract kicked in, it will be $73 million for year one of Gaudreau's next deal. That's a 13.5 percent increase from three years ago. Multiply Hall's $6.0M AAV by 13.5 percent and that works out to $6.8 million. Why it's Relevant - Giordano is Calgary's captain and at this point arguably the team's best player. He's also the backbone of the team and its most important player in terms of experience and role. Gaudreau will eventually supplant Giordano in terms of impact. For the next year or two anyway, Giordano should earn more than Gaudreau based on experience, service time and his all-round game. The late bloomer has established himself as one of the NHL's top defencemen. While we don't know when it will kick in and it could very well be later than normal given his career arc, age-related regression will happen for Giordano and that's built into this contract. Gaudreau's next deal, which starts simultaneously, is for a player that is entering his prime and will be there throughout the entire term. In a deal that is six-or-more years, Gaudreau's AAV should end up greater. Why it's Relevant - As essentially a UFA this summer, Stamkos chose to stay with the team he's been on in lieu of sign somewhere else. In buying out UFA years for Gaudreau, you're asking Gaudreau to do the same and for the same reasons. You'll want him to be part of a solid, young nucleus that should -- and this is a business of assumptions -- leave Calgary among the NHL's better teams once we get five years down the road when Gaudreau reaches his free agent years. 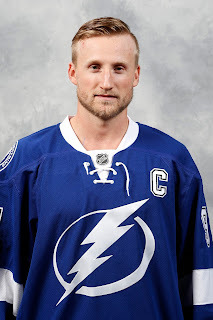 Stamkos is an established superstar, who has four 40-goal seasons. He is getting paid for the scoring totals that he has put up -- no projections here, no hypothesizing. There is nothing more certain to happen than what has already happened. Gaudreau should not get this same benefit. Sure, he might put up gaudy offensive totals over the next five seasons, but how much do you pay for 'might'? It can't be as much as 'did'. As for the argument that Stamkos could have gotten paid way more if he signed elsewhere, he didn't so that's just speculation and not really admissible. Speculation cannot be a comparison point. Hey, the hometown discount is alive and well. Why it's Relevant - What separates Benn from the others on this list is he has a similar draft pedigree to Gaudreau in that he also went insanely late in his draft. In fact, as a fifth rounder in 2007, he went 25 picks later than Gaudreau. Would he have gone first overall in a re-do of that draft like Gaudreau? Probably not. We'll reserve that spot for Patrick Kane, but he's probably No. 2, ahead of PK Subban. The relevance to Gaudreau is Dallas has bought all UFA years for Benn. It's those years and how to value them that is possibly one of the sticking points in the Gaudreau talks. Like Stamkos, we're again talking about a player in which you're not paying him for projections, you're paying him for what he's done. In working in partnership with a young centre (sound familiar?) in Tyler Seguin, Benn has established himself as a superstar. He's put up three straight 30-goal seasons. Two years ago he won the Art Ross, last season he was the runner-up. He's big, he's physical, while still being highly skilled. 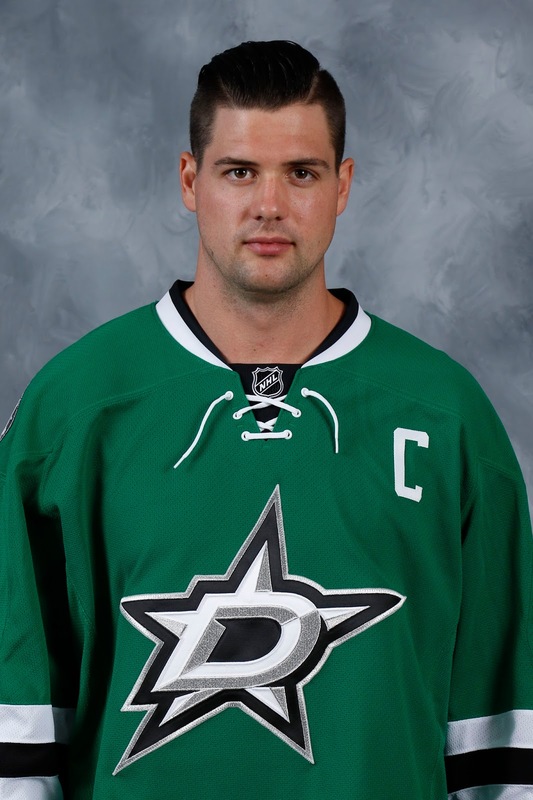 Plus he's an established leader of the team, who has captained the Stars the last three seasons. There are attributes there that Gaudreau simply does not have. No way should Gaudreau be anywhere close to Benn's salary at this point, who is on his third deal. I'd say subtract at least two million from Benn's AAV to get into Gaudreau's range. 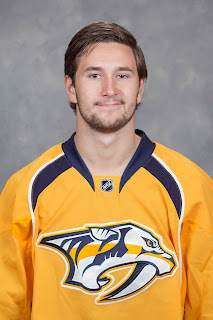 Why it's Relevant - In terms of goal production, Forsberg's career has begun similarly to Gaudreau. In his first full season, he scored 26 goals (Gaudreau had 24). He followed that up with 33 goals as a sophomore (Gaudreau had 30). Forsberg is one of those 12 players since 2004-05 to go 20-30 in goals to begin his career. While their positions are the same and they both will be first line wingers, Gaudreau separates himself with his playmaking ability. Forsberg may score more, but Gaudreau will pile up more points. For my eyes, Forsberg was more of a comparable for Monahan. Why it's Relevant - The relation to Kucherov is they are both from the same 2011 draft class and as Tod Button explained, the Flames had their eye on both of them, uncertain how high to rank them. 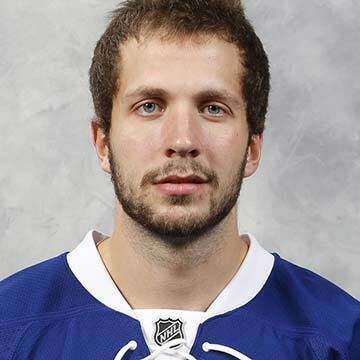 As the story goes, Kucherov went much earlier than they expected, going late in round 2. Another similarity is both are similarly-aged critical parts of their team. 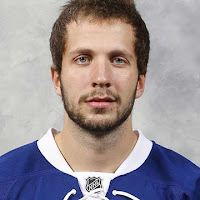 We can't compare to Kucherov's deal as the Russian is in the same situation as Gaudreau at the moment of being an RFA. In terms of who should command more, probably Gaudreau as he's been a bigger point producer. That said, Kucherov does have the three full years of NHL resume and also going for him is he has been a beast in the post-season with 22 goals and 42 points in 45 games. That will carry some influence. While the Lightning have a stronger supporting cast in Stamkos, Tyler Johnson and Ondrej Palat, Kucherov is one of the linchpins of that Tampa Bay attack. 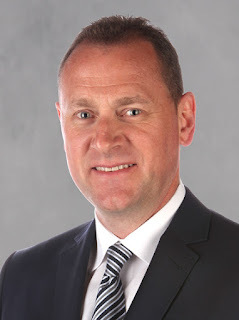 You can bet Treliving has his ear to the ground on Kucherov talks with the lower his AAV, the better. If Gaudreau wants an eight-year deal, it's really hard for me to envision the AAV exceeding $7.5 million. Might he turn out to be underpaid down the road if he got the matching 8Y/$60M deal that Tarasenko and Ekblad did? Sure. But don't overlook that there's also risk on the club's behalf that he will be overpaid. Both sides have to accept an element of risk. From the team perspective, Gaudreau's struggles last year to produce on the road remain something you wonder about. The match-ups against him certainly aren't going to get any easier. Also, what about the wear and tear that can add up on a guy with a slight frame when playing in the Pacific Division and matching up against bullies like the Ducks and Kings. 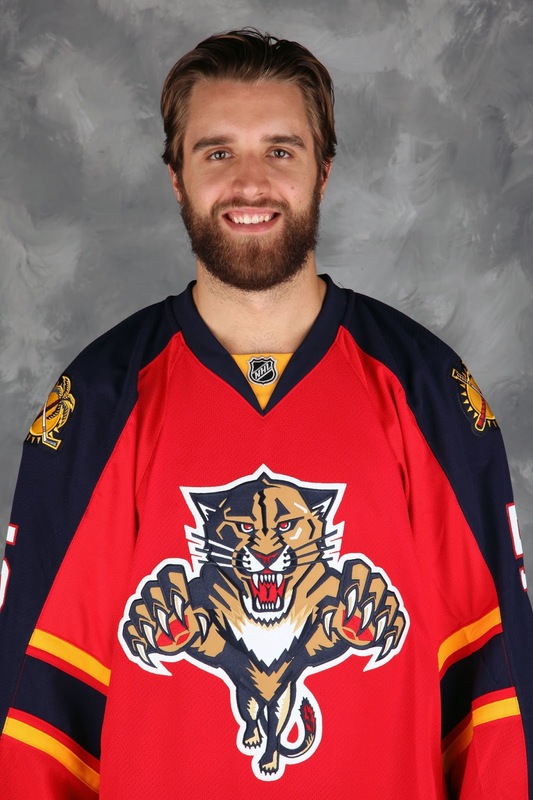 Ekblad, a stud young defenceman. 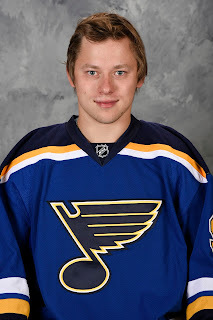 Tarasenko, a guy that can dominate. At this point, how does Gaudreau ask for more than those two equally important players to their respective teams? Often misunderstood and worth explaining at this point is Gaudreau is still five seasons away from being a UFA. When Tarasenko and Ekblad were done their entry-level contracts, they were just four years away. This means the Panthers and Blues had to buy out four UFA years while Treliving, should he go eight years also, would only need to buy out three UFA years. The reason for the difference is Gaudreau burned the first year of his ELC playing in game 82 in 2013-14 in Vancouver. While doing that got Gaudreau to his next contract quicker, it did not change how quickly he gets to free agency. For the purpose of free agency, a professional season is defined as playing 40 or more NHL games. Gaudreau won't have his seven years in until after the 2020-21 season which is also the same summer he turns 27 -- which is the other criteria for becoming a UFA. Factor that variable in and it makes even more unlikely that Gaudreau's AAV will exceed $7.5M and a compelling case could be argued that it should be less. Add in an RFA year and subtract a UFA year and you're probably shaving $3 million off the total value of a deal. Spread that over eight years and that's $375,000 off the AAV. There's been a lot of talk about Gaudreau and his contract this summer. I mean a lot. Take all the talk about Donald Trump, Pokemon Go and that lovely flower Hope Solo, then double it, and that equals the volume of Gaudreau contract talk overheard on the streets of Calgary alone. As the contract negotiations have dragged on, a state of delirium has seemingly set in with the nervous residents of Flames nation. I've frequently heard a suggested AAV in excess of eight million and from some -- presumably with a history of concussions -- I've even heard nine million bandied about. Think about the proven, established, well-rounded package you get with a Jamie Benn and a Steven Stamkos, who are both on their third contract. Both are their team captains and have been for years. There are attributes in there you just don't get with Gaudreau. Maybe he'll get to that earning-power eventually, but not this contract. Ekblad and Tarasenko are great comparables but one year further away from free agency, is an 8Y/$60M deal even on the table from the Flames? Shorter term like Kane went with his second contract is possible but how short? It won't be a matching five years like Kane got as that would take Gaudreau right up to UFA and not beyond. That wouldn't make any sense. Plus, from the few whispers we've heard, long term seems to be the preference for both sides. So you're at six or seven years. If going six years and buying out just a single UFA year, my guess is you're around $40 or $41 million and an AAV under $7M. I expect he'll get more than Monahan but there's some sensitivities to navigate there given the two have been a duo act the past two years. Also, like Ekblad and Tarasenko, Monahan is one year closer to free agency compared to Gaudreau. Managing that gap and keeping it under a million is something I'd expect. I can see the Flames lobbying hard for the Hall deal -- inflation factored in. Seven years and $47.6 million for an AAV of $6.8 million. Same term as Monahan but with an AAV gap of $425,000. But Gaudreau's side likely points to all the No. 13 jersey sales and gives it a big thumbs down. I don't subscribe to the notion Gaudreau's AAV cannot be above Giordano's given the different stages their careers are at but if it is higher, it will only get there via a long-term deal like seven or eight years. Six will be close. Benn and Stamkos are on much higher AAVs that they have earned through a combined 15 years of NHL service. Gaudreau is at two. Despite the similar start to their careers, Forsberg's presence on the list provides context that even on a six-year term, Gaudreau should still be well above $6M for AAV. 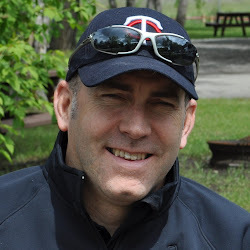 It was the summer of 1985 when Kent Nilsson left Calgary. Not since have the Flames had an electric talent in their line-up like Gaudreau. 'Worth the price of admission' is not an expression to use recklessly, but it applies to this guy, especially considering the dreg this club iced back in the late 90s. and early 2000s. For that reason, a seven or eight-year deal would certainly be the desire for the Flames right up through ownership. Enjoy this kid's enormous talents for as long as you can. That said, it's a business and there are other mouths to feed. Always the shrewd negotiator, Treliving isn't about to abandon all reason with this particular player, who has no real leverage. If the Gaudreau camp can't get the number they want for eight years term and given the self-belief Gaudreau has always had to have to overcome skeptics his whole career, I can envision a scenario where the compromise in the end is six or seven years of term and with a lower AAV. For a guess because if you've read this far, you deserve it, I'll say seven years at $50 million. That's an AAV of around $7.15 million. Monahan is content as the gap of $765,000 is acceptable. Calgary can live with it as they buy out two years of UFA and have the diminutive dynamo until the summer of 2023. As for Gaudreau, he gets himself the largest contract in Flames history, both in total value and AAV. Plus he'll be a free agent at 30. If all goes well, that still leaves room for another big payday. Kane certainly is far from slowing down and he'll turn 28 in a couple months. Who knows, maybe that next contract ends up being an extension signed on July 1, 2022. The city of Calgary is, after all, a great place to live. 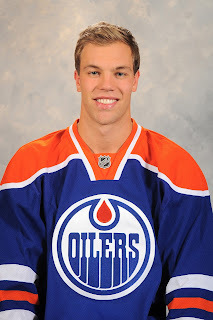 Besides that, coming off three Stanley Cups in the last four years when that time comes, who would want to leave that? Good article Darren. We talking about Gaudreau over on CP now. We agree with you. Thanks for the 'vote of confidence'. Does this mean I'm going to get fired within the next couple weeks? Ha ha. How does one get a cool nickname like "The Scorpion" anyway? You know you can't get yourself a nickname right? That is one of the first rules of life. I want to take a position that will likely not be a poplar one, but after dew consideration I think it has to be strongly considered. That is to trade Gaudreau. I am suggesting this because although at this point the Flames have the cap space to keep him they have Bennett, and Tkachuk needing contracts in the very near future. Expect both to be fairly sizable. They will no doubt have other contracts as well. Then there is the question of position. A teams first priority should be in net building from there out. The LW position is the easiest to fill even on the first line. Where as the RW has not only been a great, and gaping hole on the Flames, it is typically league wide. As good as JH is he is not filling an organizational need. The next consideration is value. Asset management is as much about putting people in the seats, as it is about building a viable team. The Flames don’t have a problem doing that, and yes JH sells jerseys, but every Flames fan is going to have one anyway. Maybe they will be Monahan, or Bennett, but they will buy a jersey even if it not Johnny’s. Other franchises can not be as sure. So part of the appeal in a different market is his ability to fill seats, and that can be turned into returning assets for the Flames. Assets that fill in positionaly better. Assets that are easier to manage in terms of contracts. Assets that end up providing a better overall team on the ice. For example that a team needs to be able to ice a certain given level of talent to be a championship team. What is that formula. How defensive, how fast, how physical, how deep and so on. Yes a star LW on your first line will give you a better chance of scoring in that position, but I think if you break it down, Gaudreau is not good value over all for the Flames. Is he worth for example a return of Jack Eichel. Buffalo has a wealth of right handed shooters, and a shortage of talent on the left. Is he worth Mark Stone from the Senators. In the first case I would say you need to sweeten the pot a bit, in the second I think you get back a bit more, but in either case you fill an organizational need. Then you open a spot on the first line, can they fill it, and I say yes they can. Not to the level of excitement we are now seeing, but to a better over all effect. I don’t know if they sign Gaudreau, or not, but they should without question be shopping him. Thinking I'd spark some conversation, I mentioned your take on Twitter and the impact was as if you hammered a wasp nest with a baseball bat. Sorry man, didn't mean to throw you to the wolves like that as I always appreciate someone taking the time to leave a well-thought through take on one of my stories. Now I don't agree with your suggestion, nor do all the yellow-jackets that immediately started to swarm but everyone's entitled to their opinion and you took time to explain your position so good on you! You probably knew what reaction you were going to get anyway. Rather than rambling on, I'll defer back to my closing paragraphs. 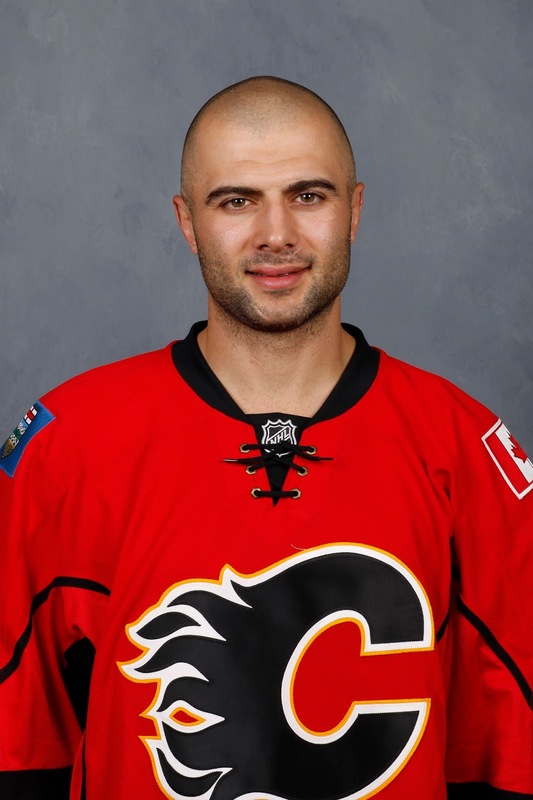 This is a dynamic player that is unlike any player Calgary has seen since the Magic Man. Those don't come around very often. Like once in 30 years is the math as I see it. Sign him, he's not going anywhere as he's got no leverage and be glad you did! Well Darren you know I love the Hockey talk, and I did know what I was suggesting would bring down the house. If/when Johnny signs, we lose nothing, he is a great player as you say. Keep in mind that magic man was a ghost in the second season. He did eventually get traded, I am sure at the time not a popular move that became Joe Who, and eventually Iggy. likely a bit more palatable with the nation. Great men, and great ideas are never popular consumption for the masses…. insert pat myself on the back here lol. I was kind of hoping Tree might wander by your page, and consider a trade for the ages. I am curios just how much he clangs when he walks. He did let Bob go, the right move no question, that created a buzz. Fans that want to get drunk on the red mile need to stop getting emotionally attached to every guy that puts on a flame jersey. If I was in Brads chair I guarantee I would be looking to make this move. Anyway I am very happy to be controversial thx for putting it out there. On paper, your argument seems fine. However Johnny is more than just his point totals. He's a game-breaker. When games get tight - and in the playoffs they get DAMN tight with tired legs and great decision-making, you need someone who can defy logic. Remember this goal by Patrick Kane last playoffs:? There are maybe five other forwards in the NHL who could have done something similarly individually in such a dire situation. Benn, Crosby, Malkin, McDavid, and Gaudreau. Maybe Eichel/Matthews someday. Even guys like Seguin, Tarasenko, Kopitar, and Tavares can't draw on their creativity like that. That's how rare a true gamebreaker is. 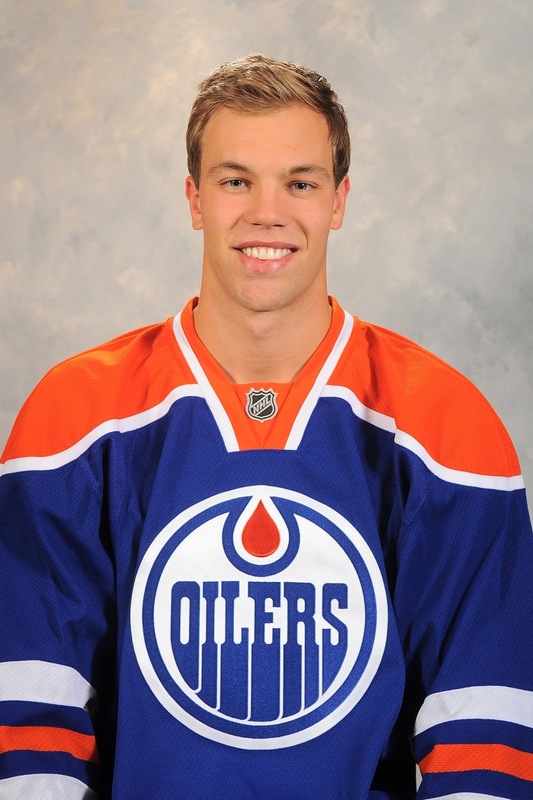 A Taylor Hall can give you the same point production but in a 2OT Playoff game he will give you nothing, just volume shooting. Gaudreau can break a game open. Remember Game 6 VS Tampa, 2OT? I do. Martin St. Louis. Gamebreaker. Your absolutely right he is dynamic, he proved that in LA when he took that game away from them, but even Gretzky got shut down. You may remember game seven after Steve dumped the puck into the wrong net, they hade ten minutes to get that back. I am also not talking about running him out of town. If you trade a JH you get back something for him. Eichel as an example. So say for a moment you considered it; Johnny not in that spot, what do you have if he isn’t playing LW first line, Tkachuk, Bennett, possibly Janko, Shinkaruk, how good is Mangiapane going to be, Dube or Phillips. I have no idea, but you have options that is clear. Are any as good as Gaudreau, no way, but you also have Eichel on the RW. That’s a better overall line. Its more difficult to cover three guys than it is one, even if the one is as dynamic as JH. Any way I’m not the GM, and I don’t get to negotiate trades for the Flames, but I would be surprised if BT hasn’t been mulling it over. The down side for him is that if you make that kind of trade, and it doesn’t workout you never recover. It defines you good, or bad. I would really love to know though if would pull that trigger. Eichel makes the top line better? How do you know? Eichel hasn't performed in the NHL at the same level as Johnny Gaudreau. He's a very promising young talent but you'd be trading a proven commodity for potential. I feel like Johnny's camp is pushing for 8 years at 8 million and B.T and friends are probably up to about 8 years at 7 million now. Normally any other Flames GM would call it a day at 8 years at 7.5 but we finally have one who is actually trying to save us that million bucks. Let see who wins! Wouldn't surprise me if it ends up at 8x7.5 in the end. Then like with the Monahan signing, everyone will wonder why it took so long. I don't think a 7.5 M dollar contract is going to look "underpaid" eight years from now, unless you can think of more revenue streams that can raise the cap higher. Any ideas in that respect? Raise the price of beer, nachos, charge more for licensed BBQ covers. More fake World Cups. Expansion to Quebec City, Seattle and Moose Jaw. Just spitballing. It's a tough 'issue' or concern for the non-NHL player like you and I to wrap their head around. Not sure $8.5M vs. $7.5M is changing your lifestyle. I am assuming you know expansion fees are not part of the CBA and are not shared with the players? As consumers, we can only handle so much. I've had the "privilege" of shelling out far too much money for nachos and a beer at a Flames' game. I eat before I get to the 'dome nowadays, and I make do without their crappy beer. Two-part answer. There was some tongue-in-cheek in there, perhaps it was more subtle than intended. I know the franchise fees go to owners but are there ripple revenue that come out of that -- bigger league, more TV? I don't know. I honestly did not put a lot of research into my answer. Perhaps I should have. Alas, if only I had more time. It would help if the NHL could get a better TV deal out of the US. I wasn't expecting a lot of research in your answer. You write a lot of articles. I hope you'll be doing some more podcasts.